Search all Littleton, Colorado real estate, homes, condos and properties for sale on one easy site. Littleton, CO began during the Pike’s Peak Gold Rush as a hot spot for gold seekers, merchants and farmers. It was incorporated in 1890 thanks to Richard Sullivan Little’s development of the Rough and Ready Flour Mill which grew the early community’s economy. Littleton is now a Home Rule Municipality and is a part of the Denver-Aurora-Lakewood, CO Metropolitan Statistical Area. It is located within Arapahoe, Douglas, and Jefferson counties and is now home to a little over 41,737 residents. 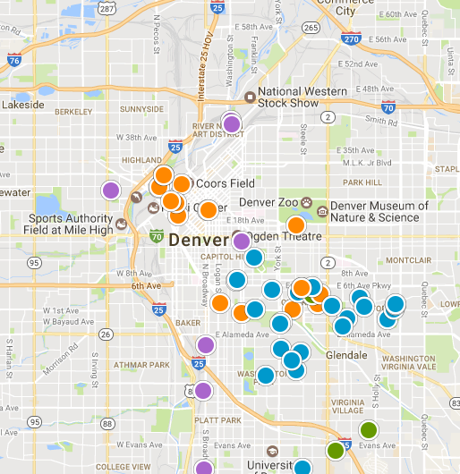 Littleton is about seven miles from the well-known Denver Tech Center and only 11 miles from the heart of downtown Denver. Littleton has over 1,400 acres of park facilities and open space which includes 200 miles of trails. With over two dozen parks, Littleton residents can enjoy outdoor recreation such as biking, fishing, and numerous sporting activities. Locals can also take a day trip to the nearby Rocky Mountains or a short drive to downtown Denver to relish in the endless mountain resorts and city amenities. There are 13 public elementary schools and four middle schools that reside within Littleton. Served by the Littleton Public School District, students in the area may also attend Arapahoe High School, Heritage High School or Littleton High School. All three public high schools offer a number of Honors as well as AP courses. Littleton has a median home value of about $402,600 for single-family homes, which is less than surrounding areas such as Highlands Ranch and Centennial. However, that number has risen a little over 11% since the previous year. Want to see the latest Littleton housing market activity? Create a free custom market report for YOUR neighborhood or area!